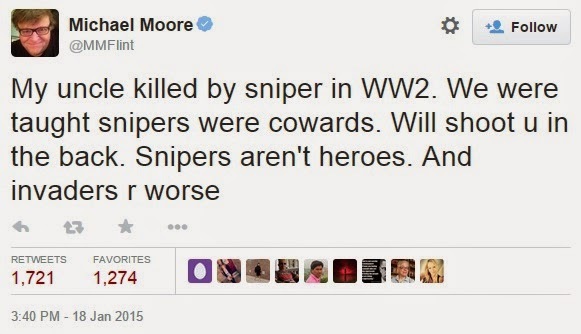 Michael Moore - I dare you to come to Fort Bragg, or Camp Lejeune, or Naval Amphibious Base Little Creek, or Camp Pendleton, or Naval Amphibious Base Coronado, and get in a sniper's face and call him a coward. I dare you. I guess we'll see who the real coward is now, eh? - S.L. That's mighty bold of you sitting there in your size ginormous pajamas bad mouthing a man who had more chutzpah in his little finger than you've got in your entire bloated body. I guess it's easy for you to call someone else a coward when your excuse for not serving is you're too obscenely obese even in your prime to pass a military medical screening. Just to show how out of sync you are with reality; if it wasn't for the efforts of THIS American Sniper there probably wouldn't even BE an America - which would probably suit you fine seeing as you hate your own country even more than you obviously hate yourself. 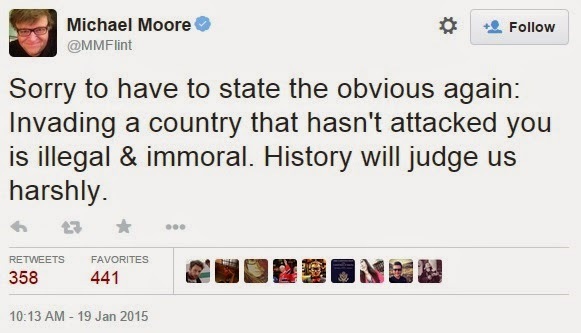 Heads Up Michael Moore: We invaded Italy, France & Germany - none of those countries attacked us - was America's role in World War II illegal & immoral? History judges otherwise . . . Your comment is hateful and totally unnecessary Michael Moore, and because I'm not a coward if you like I'll say it to your face: you, sir, are an absolute shitbag . . .
How about all those hawk-eyed American riflemen picking off British officers in the American Revolution and the War of 1812? Or outfits like Berdan's Sharpshooters in the Civil War? That kind of precision marksmanship is the very breath of american military tradition. The Big Fat Pig had to say something, and, as usual, it was something stupid. He's echoing something real though. Enemy snipers just weren't taken prisoner in WW2. But that has more to do with the nature of sniping and it being personal rather than to whom it may concern and the hatred that engenders. The enemy part is important about the attitude too. The bad guys are all cowardly scum who need to be scoured off the earth. Our snipers are salt of the earth, virtuous heros all! Perfectly normal, really. Mike just reports the teeny part that gets the spotlight back on him while blithely ignoring the rest. HAPPY AUSTRALIA DAY ! ! ! "IT WAS JUST A STRAIGHT-UP BRAWL"